NEVER EXPERIENCED WHAT IT'S LIKE TO LEARN FROM ANGELA? Listen to this free audio training on how to simplify the way you think about investing. Deep stock insights and trainings delivered straight to you. Perfect for the busy professional on the go who doesn't have time to do tons of research, or stay in the know! The perfect resource for someone who wants to become a serious investor. 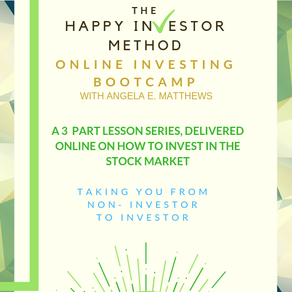 In this 4 month program you will plan short- term and long-term investment goals. Let us notify you of upcoming education opportunities. We keep in touch via email.